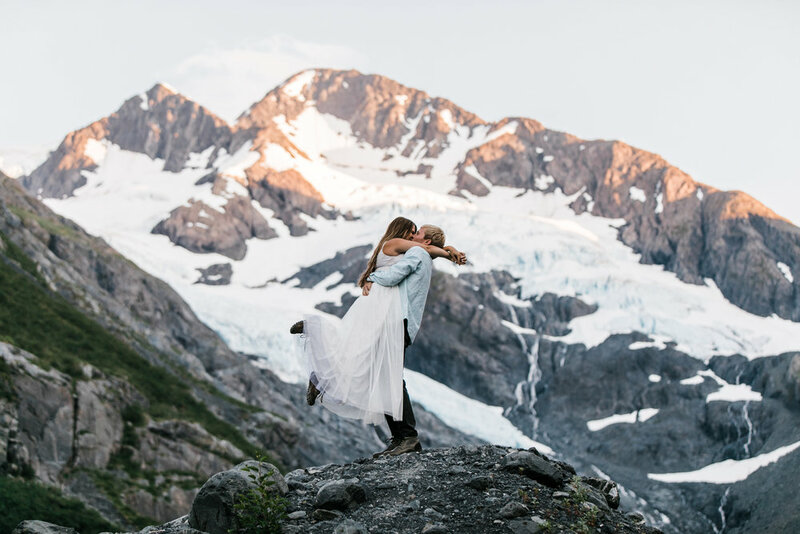 At this point in our lives as adventure elopement + intimate wedding photographers its hard to imagine falling in love with a destination the way we have with Yosemite and Moab, but that's what happened when we arrived in Alaska. Honestly, this place lives up to the hype. We thought we'd hit the mecca in Patagonia, but it turns out this world is all full of surprises. Among the massive landscape of Alaska are ice fields, glaciers, fjords, and gigantic mountains, altogether showing adventure takes on its purest form here. 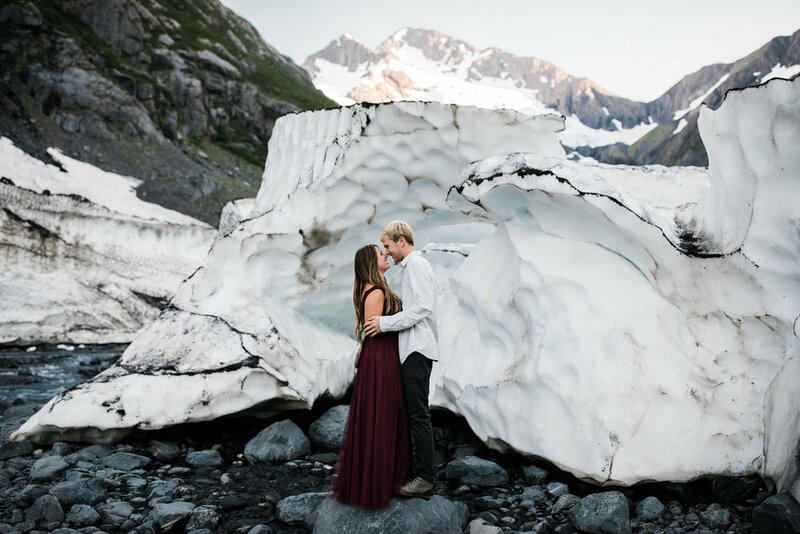 These amazing landscapes are why Alaska is a dream destination for adventurous couples, but those who are drawn here have to be up to the task at hand. 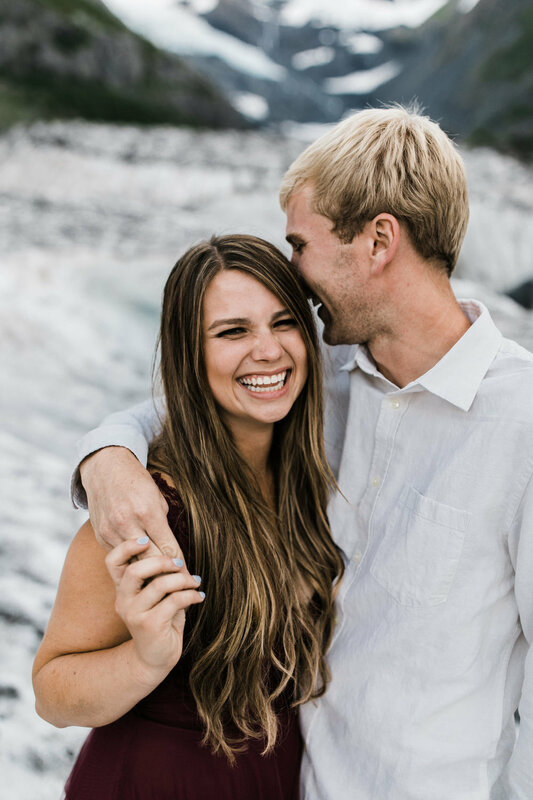 With all the anticipation of the shoot, we were so excited when we finally met Ashley and Matt for dinner (because when the sun sets at midnight, you can meet up for dinner before your shoot). 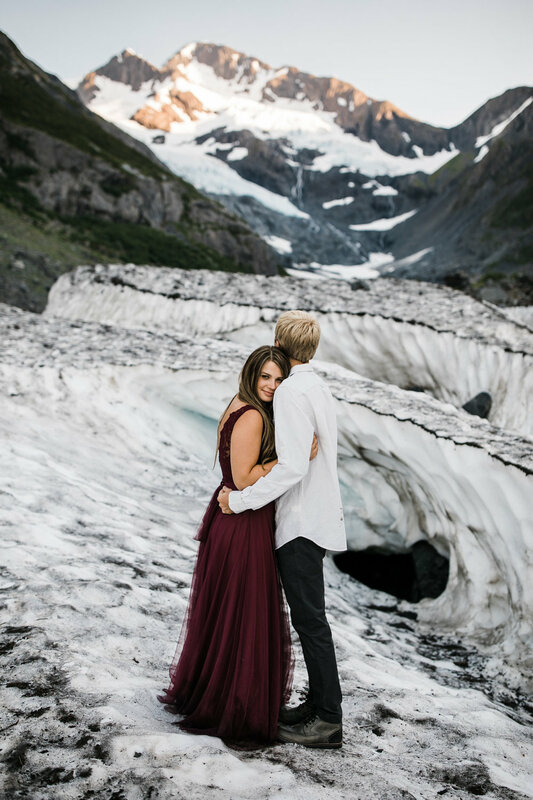 Alyeska and Girdwood themselves are fantastic to take engagement photos, but the surrounding area has a crazy amount of beautiful places to shoot. After traveling all the way from Michigan, Ashley and Matt were wide-eyed and excited to get going. We scouted a route out before and drove over to Byron Glacier to hike around (safely... it can get dicey pretty quick out there, and there are plenty of tours to take if you want to get on the glacier itself). 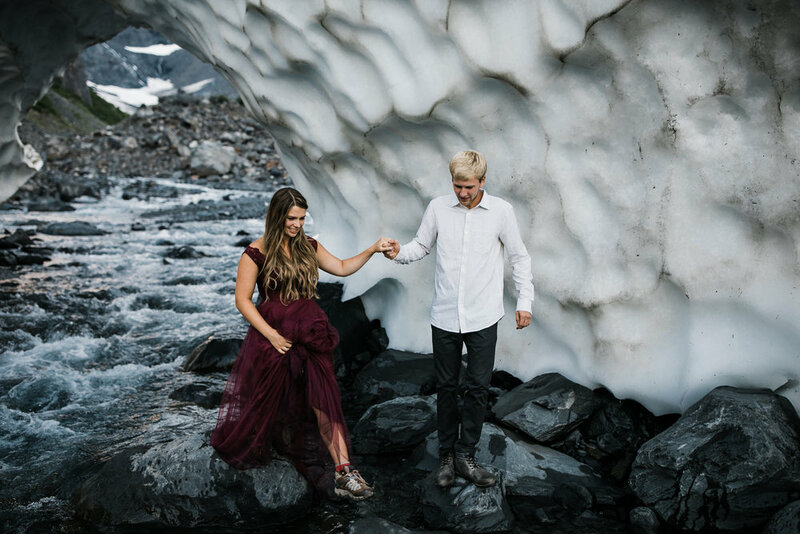 As we hiked up to the glacier, Ashley told us a bit of their wedding plans, about when they met in high school when they were fifteen years old, and how they have been together ever since. We bonded over our love of Parks and Rec, our dogs, and stories about our families. As we walked, I needed to take a step back at what was happening. Amazing people and places like this constantly make me like I have the best job in the world, but what I love most about these moments in these places is how they are just a part of a something bigger – a tiny permanence amidst a gigantic one. 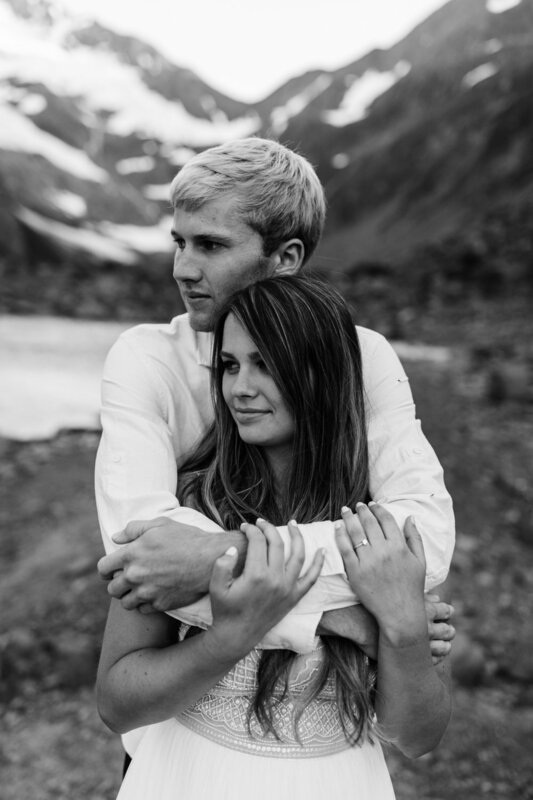 I always imagine people's lives back home - Ashley and Matt's friends and families thousands of miles away in Michigan, their puppies, and the coffee shops and college campus where their love has grown right up until this point. Then I think of right here and now, creating these crazy memories in Alaska, and I realize why photography is so amazing – we're really just folding the corners of our favorite pages, making little dog-eared creases to go back to when we want or need to later on. Honestly, I have to pinch myself when I think of this moment for what it is - an exclamation point in the middle of a paragraph those pages, altogether telling a great story. I love soaking it all in, but also remembering how there's so much more to come after this, and how something as ordinary as two high schoolers falling in love their sophomore year can lead to such a great adventure!! Big places like Alaska with histories and futures full of adventure make it easy to think of love this way. It's just so rad to play a little part in the telling of their story. 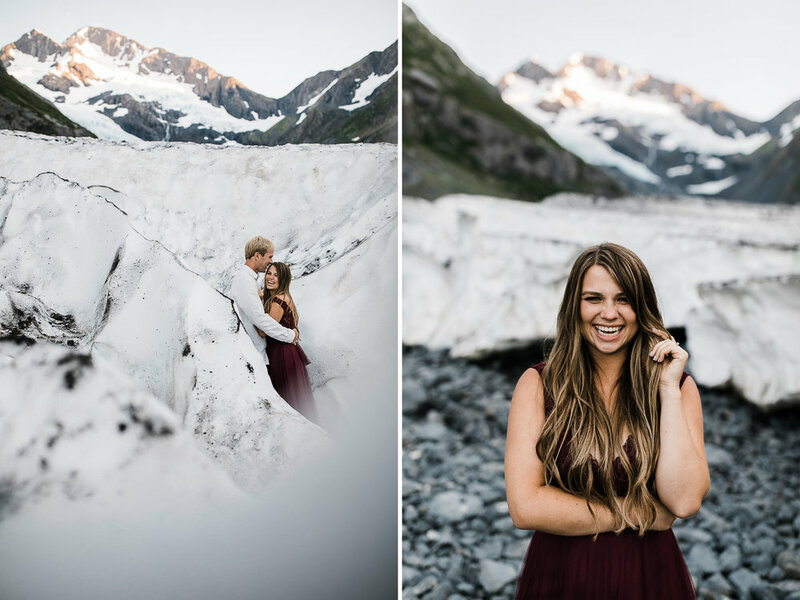 Ashley and Matt fit right in as they climbed around the toe of the glacier and then exploring the crazy ice formations. 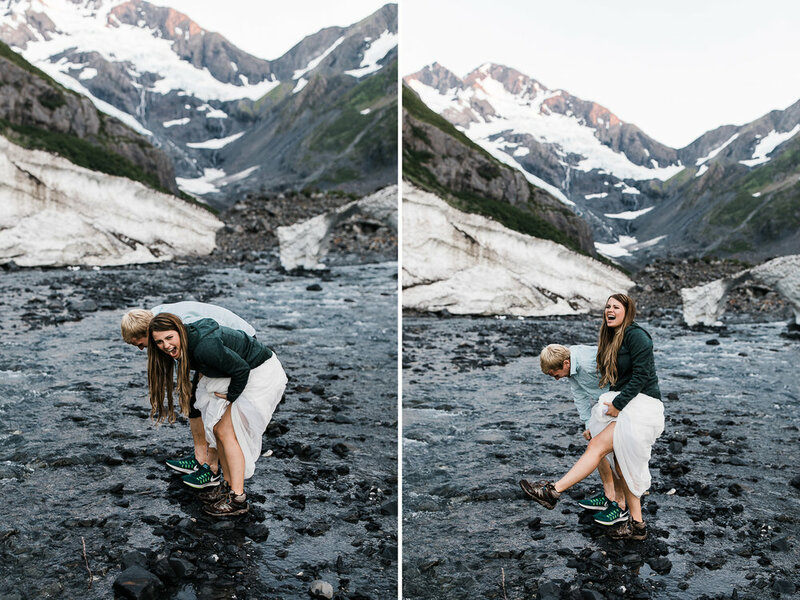 I love how our couples are down to wear boots, hike, and get their dresses and pants a little dirty – Ashley and Matt are no exception. Matt was also super chill when it came to the hike and all the obstacles, but mostly his attention was on his fiance and the amazing scenery all around us. 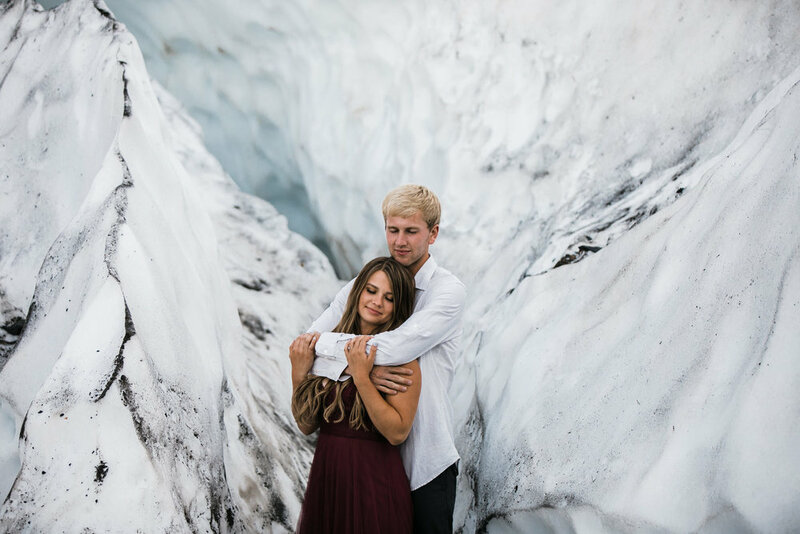 They were an easy couple to get along with, as one moment we'd be laughing like kids as we slid around and the next staring up in awe at the grandeur of this creeping monument of ice. Then things got seriously amazing. We shot a ton of beautiful pictures around the area leading up to the glacier, but then we saw a delicate ice arch just across a river. The opportunity – even though it promised freezing cold toes – was too good to pass up!! We took off our shoes and waded across the shallow river which didn't take too long, but it was still freezing cold - definitely type two fun. But the pictures and memory of the adventure were entirely worth it. This session put all of our hopes for Alaska to work and ended up exceeding any thoughts we had. 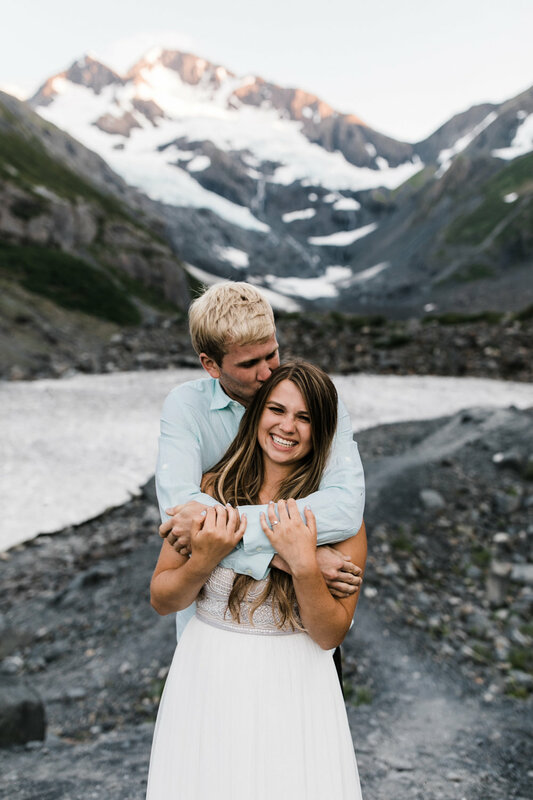 The photos were amazing and captured this couple's love for adventure, nature, and each other perfectly!! 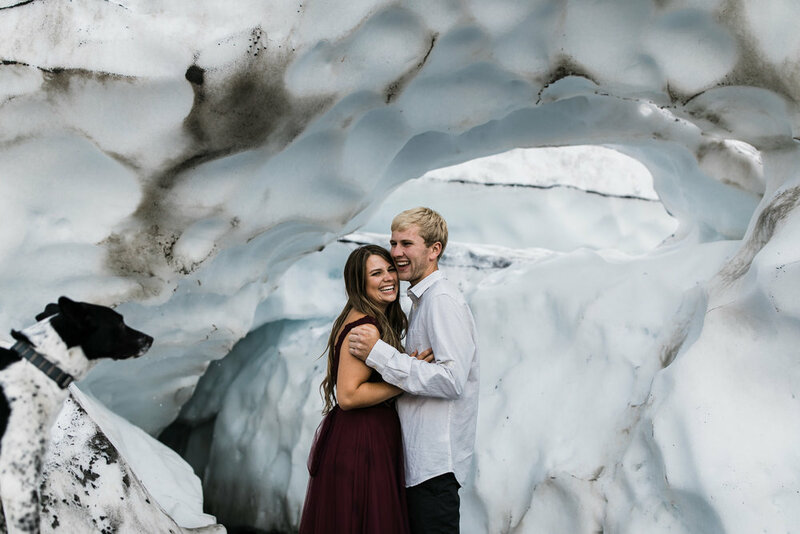 Seriously, this trip made me want to come back for sooooo many more engagements and elopements up in Alaska! It's been on our mind ever since we left since we feel like we barely tapped into the potential up here. 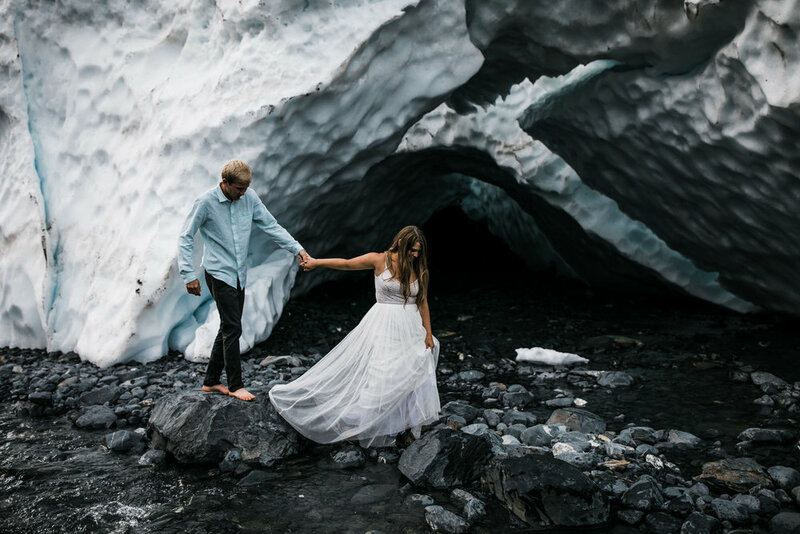 Callen and I talked about it, and we're definitely hoping to book a lot more wedding + elopement photography gigs up here in Alaska next summer.